2nd Annual Flight for Charity Disc Golf Tournament was held 14th of October in Lumberton, Mississippi. Here’s the tournament report straight from Nicholas Hartley on Team Latitude 64°. Last year we were lucky enough for our 1st Annual Flight for Charity to raise $3,367 for Hope House of Hospitality. This year not only did we beat last years numbers, we more than doubled our donation to Hope House. At the end of the day we wrote out the check for $7,281 but with a couple last minute donations and sales our final number was $7,461 total given to Hope House of Hospitality this year. In our 2nd year we more than doubled our previous year and surpassed our personal goal!!! We are very pleased of our success and will continue to strive to be bigger and better every year. 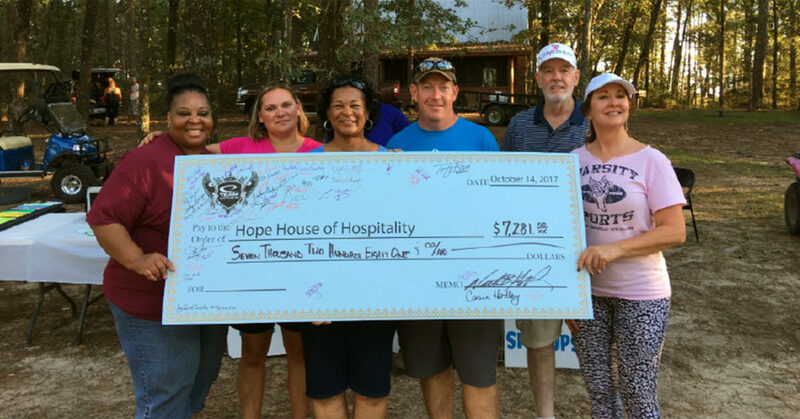 The check below was signed by all the players and friends that were at the tournament and was given to Hope House Director Wanda Pitts, staff and contributing partners along with my wife Casie and I. An ACE was hit during the first round on Hole 4 but they were not in the ace pot so everyone threw off for the ace pot. We had a young lady on her first tournament , win the throw off to win our ACE POT Prize Pack. This year we were going to do better, so we had to think outside the box a little. We had a doubles event “Better in Pairs” for friendship, compassion and support. We also had Mixed Doubles Pro / AM divisions along with our “NEW” Division Parent and Child. Mixed Doubles division we had people that come out that never have played a tournament before or come out with their husband to play that do not normally come to events. Also they have said “They only come to our events” because they are so much fun and don’t feel the pressure of a normal event. Parent and Child Division we had 3 teams show their support and we thought it was awesome for Father/Son and Father/Daughter Teams to come out. They all played the same card together and had a blast. Not only did they all receive prizes, we gave all the kids Latitude 64º Disc Golf Bags to show our support back to them. All players in our event left with something, even if they did not place in a normal payout scheme, we always give to everyone that shows support to our cause. It’s just a fun tournament. Raffles and lots of raffles. This year we had $3000 in retail donated raffle items. We had signed disc golf disc from Pro Touring Players, back pack coolers, Disc Golf Carts, Bluetooth shower heads, fishing lures, TV etc. we had it. Thanks to all who donated we raised $1604 in just raffles the day of the event. Thanks to Casie Hartley for organizing all the donations in buckets with custom vinyl lettering for each one. Donations to Hope House were also accepted. We loaded 2 vehicles down with donations and left over water/Powerade from our event. Plus the non perishable items left over from lunch. Casie and I would like to personally thank everyone that attended or helped out with the event. We would also like to give a huge shout out to all of our Sponsors. Without the support from our Friends and Sponsors we cannot put this event together and have the success that we do. Last but not least the players that come out and show their support during the event and their generosity giving so much money with our raffles. We ended up with 110 T-shirts, 100 disc, banners and 18 Tee signs along with our Facebook Event page to honor our sponsors. Plus the players received a lot of good looking prizes. The shirts will be wore and the discs will fly so the sponsors will live on from year to year. We will also have all the banners up for next year also to continue to support all who support us.